The talented and beautiful Margot MacDonald returns to Iota this Sunday, March 29 for more inspiring acappella and live looping performances. She has visited Clarendon many times in the past and always stunned audiences with her voice and talent. Also on stage this Sunday will be Julia Weldon and Dr Robinsons Fiasco. Music starts at 8pm with a $12 cover. Clarendon is set to be a crazy green mess on Saturday March 21 with the annual Shamrock Crawl! Between 2-5:30pm and get ready to rave at some of Clarendon’s most popular bars including: Spider Kelly’s, Hunan One, Mister Days, American Tap Room, Mad Rose, Whitlow’s, Hard Times Cafe, SoBe, Iota, and the brand new Don Tito. Tickets cost $15 for early bird prices go up to $20 on March 3 at midnight. $30 at the door. 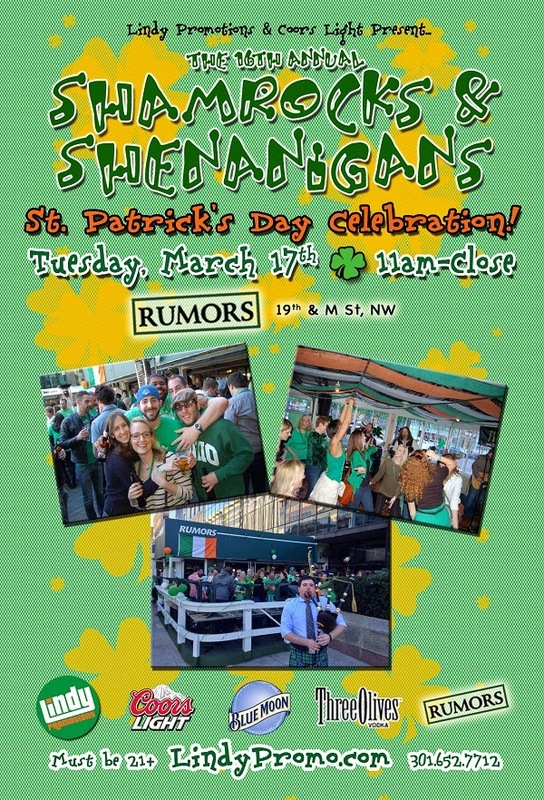 Lindy Promotions is throwing their annual St. Patrick's Day Party at Rumors in Dupont Circle, DC on Tuesday, March 17th. The festivities kick-off at 11am and hundreds of Irish party patrons will be able to enjoy beat the clock drink specials starting with $1.17 Coors Lights, $2.17 Blue Moons, and $4 Three Olives Vodkas. Check out their event page for more info and cover charges. 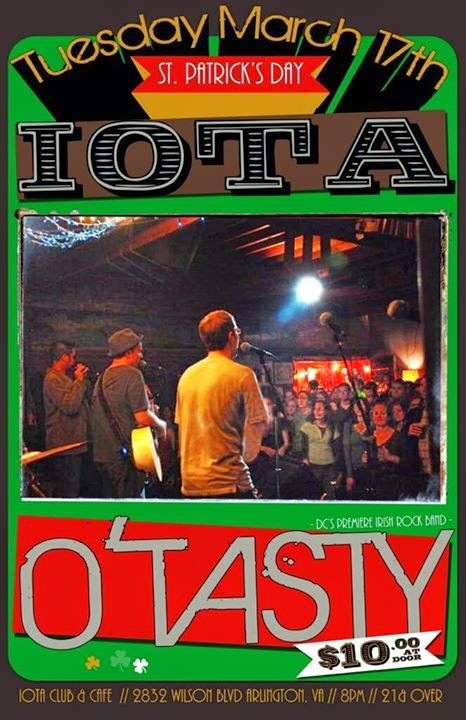 Local Irish rock favorite O’Tasty is making a much-anticipated return to Iota for St. Patrick’s Day this Tuesday, March 17. The seven piece DC based band that named itself after a local Chinese food takeout restaurant has a decade-long history in the DC area and has played Iota multiple times. O'Tasty plays traditional Irish songs in its own upbeat style and the occasional Pogues or Ween cover, but is known for its high-energy songwriting. The Irish Rock band is rooted in the Celtic Punk tradition with instrumentation that includes guitar, bouzouki, mandolin, accordion, flute, bass, drums, fiddle and bodhran. The show starts at 8pm and cover is $10. 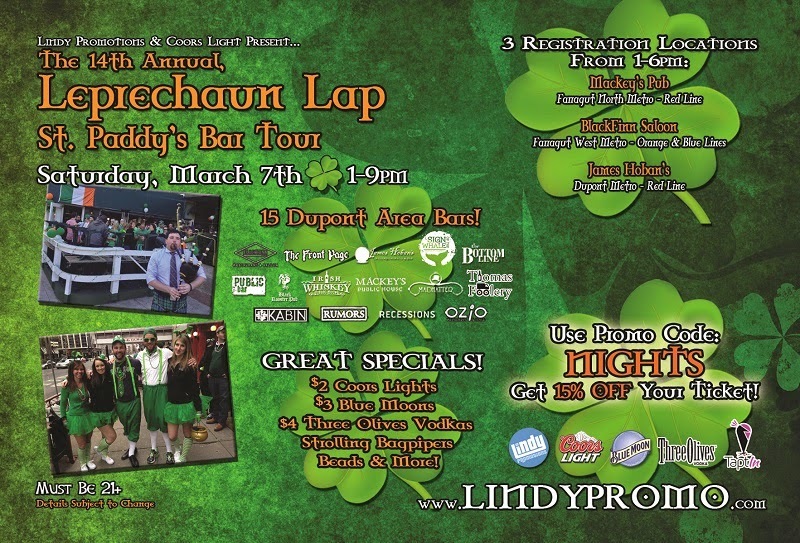 The 14th annual DC Leprechaun Lap St. Paddy's Bar Tour will take place on Saturday, March 7th. 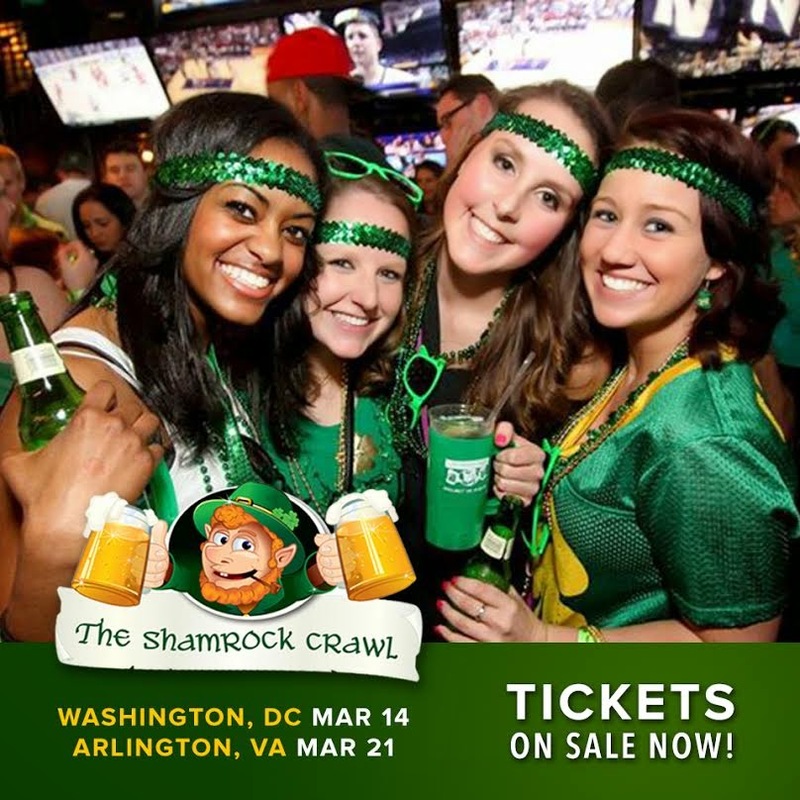 Join Lindy Promotions and thousands of other Irish partiers as they paint the streets green and bar-hop around to 15 Dupont bars. From 1pm-9am enjoy $2 Coors Lights, $3 Blue Moons, $4 Three Olives Vodkas, various food & shot specials, strolling bagpipers, giveaways and more! Don't miss out on DC's Official Kick-Off to the St. Paddy's Season! Be sure to use the promo code: NIGHTS for 15% OFF your tickets! The most exciting and entertaining cover band I've seen this year is coming to Clarendon Grill this Thursday March 5. Party Like It's... is an amazing five piece band that is extremely talented in performing favorite hits from the 80s, 90s and today along with some of their own ska tunes. Vocalist Cathy DiToro lends a strong and versatile voice as the group's front woman, while Ume is the most entertaining with his antics and hyper Trombone playing craziness. If you don't get snowed in this Thursday, come out to Clarendon Grill at 9:30pm for a no cover awesome show!